Non-Chemical Water Treatment | Home Reverse Osmosis Water System The system requires very high pressure because the membrane used as the filter medium is essentially non-porous. No power required - permanent magnets supply "free" effective energy. No power supplies to burn out. Chemicals may be hazardous to employees or environment whenever processes fluids are flushed /spilled. Sodium must be added to the water in place of the mineral that is removed ("salt-ion exchange"). The mineral deposits slowly damage the system. In areas that have high mineral or salt content, the membranes must be flushed frequently (and replaced often). No continuing maintenance required after the installation and no recharging or further attention is needed following the initial techniques and/or the Stabilization Period. May incur unwanted pressure drop increasing energy requirements. The sodium released into the softened water is corrosive (the corrosion due to scale has been replaced with corrosion due to sodium - an undesirable trade-off). Health & environmental hazard due to hypertensive effect of sodium on human body (the delicate electrolytic balance of sodium/potassium ions is unsettled) and danger of sodium toxification to the area ground water (in increasing areas the communities, doctors, hospitals and rest homes prohibit salt-ion exchange systems). This always requires downtime and a major usage (loss) of water. R/O units typically waste half of the processed water. A "snap-on" design, unlike the other solutions that are "inline" and become part of the system is removable (and portable) allowing risk free testing & installation. 1. 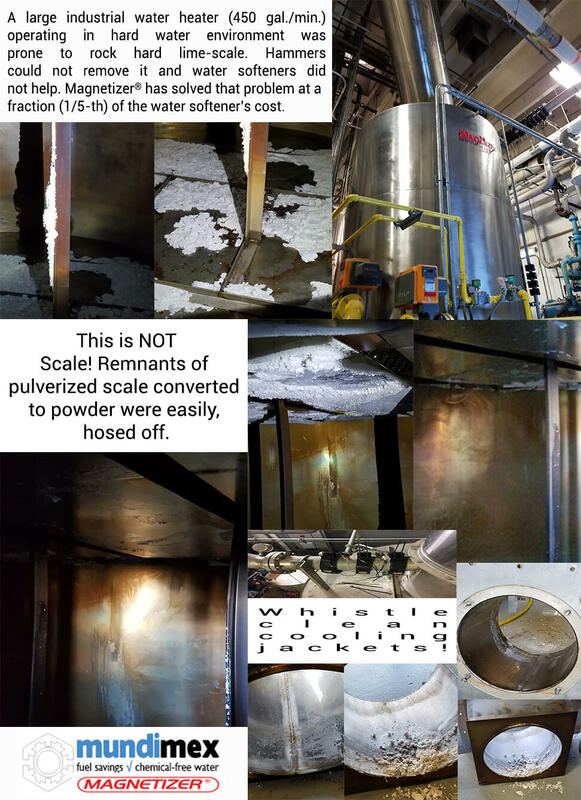 Removes permanently scale in pipes, plumbing, boilers, heaters, ovens, heat exchangers, cooling towers, chillers, condensers, dishwashers, bottling machines, laundromats, laundry machines, car washes, injection mold machines, etc., and stops corrosion. Acts curatively and preventively. 2. Increases the lifespan of equipment due to lack of scale and corrosion, which means reducing their break-downs (repairs, downtime) and a better protection or resale value of the real estate. 3. Softens water in a natural way, without the use of chemicals. 4. Eliminates the need for expensive salt, or sodium based water softeners, or any other chemical, mechanical, magnetic or electro-magnetic descaling device, for better quality and taste of water and healthier environment. 5. Lowers water surface tension – improves the flow of water (increased pressure), its behavior and effectiveness. It also means reduced electricity bill, thanks to a better job of pumps due to decreased surface tension. 6. Saves water consumption due to the lowered surface tension – the municipality of San Diego confirms 20% savings in water consumption and a vineyard in California a 25%+ savings (reports available). 7. Neutralizes (stabilizes) the pH of the water, so that water is better and more pleasant to use (does not feel “slippery” like with salt-based water softeners). 8. Completely oxygenates water – making it better for people, animals, and plants (scientific research available). 9. Water is naturally healthier because it contains minerals (Ca, Mg), has a stabilized pH, with sulfur odor repressed. 10. Inhibits and removes algae and bacteria killing colonies of Escherichia coli by 80%-90%. 11. Saves electric energy required to heat water due to the elimination of heat transfer loss, as there is no more limescale in boilers/water heaters. 12. MAGNETIZER® is not a filter or RO devices, but it complements them and works very well with the filters improving their efficiency and extending their service life, due to decreased surface tension and break down of dirt particles. It increases the regeneration cycle of filters and the reverse osmosis (RO) equipment (reducing pollution carbonate, and reducing the number of particles in the group which translates to a reduction in surface tension and better water filtration, as well as time saved in passing water through a membrane). 13. Used on water input of commercial dishwashers it improves washing process, with no white stains and deposits (spotting) and saves the amount of water consumed. Reduces the consumption of detergents and soaps. For benefits in commercial laundries – see section below. In sum: We offer environmentally safe & friendly non-chemical water treatment for used by industrial plants, municipal facilities, buildings (schools, hotels, dwellings), swimming pools (click here), water purification stations, et. al. MAGNETIZER® saves water consumption, lowers operating costs and maintenance of water and sewage equipment, improves the quality of water. All this with elimination or significant reduction of the chemicals and softeners required by traditional methods. 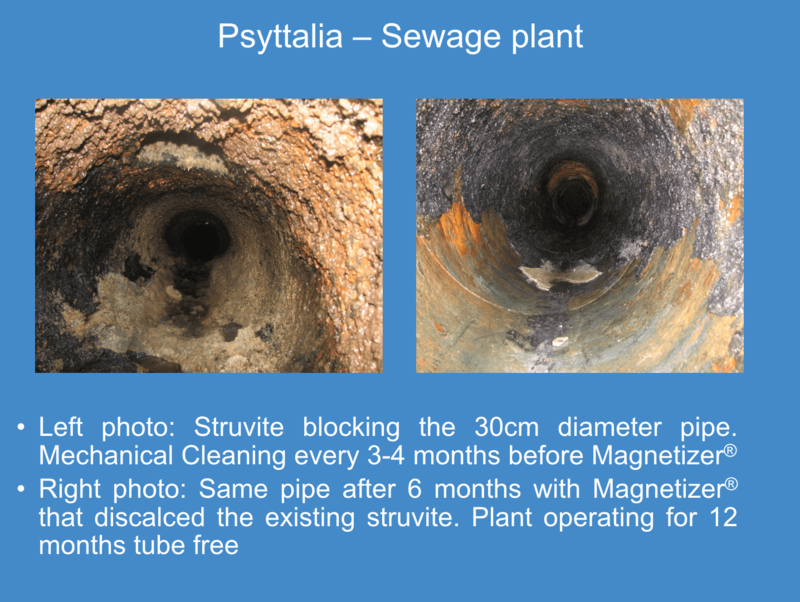 MAGNETIZER® descales water infrastructure, preventing breakdowns/problems associated with hard water. It protects the capital investment. 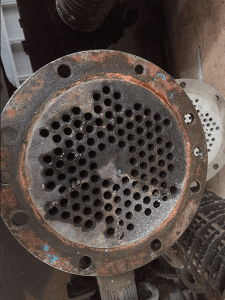 MAGNETIZER® solves hard water problems in diverse water infrastructure (pipes, boilers, heaters, heat exchangers, chillers, cooling towers, evaporators, condensers) aiming to remove scale and/or prevent corrosion and metal pitting. All this facilitates a reduction in operating and maintenance costs (labor, chemical water softening, parts, repairs) while maintaining the continuity of operation and better allocation of labor, with the reduced depreciation of water equipment/infrastructure and their preserved capital value. 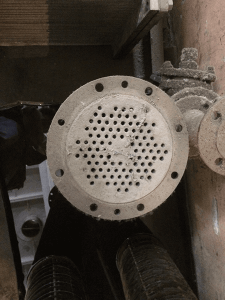 A boiler in a hospital in Nürnberg, Germany, permanently cleaned and cured by Magnetizer® of scale and corrosion without the use of chemicals. The MAGNETIZER® bactericide application is far ahead of the usual bi-polar water conditioning other devices on the market offer. This translates in selecting our technology as the “go to” solution for improved water quality needs. This appreciation is no surprise to us as we have already sold over ten thousand home water energizer “RWE-S” systems to Japan, not exactly for water softening purposes, as Japanese water is naturally soft, but for bactericide application which home and apartments owners in Japan are sensitive about. 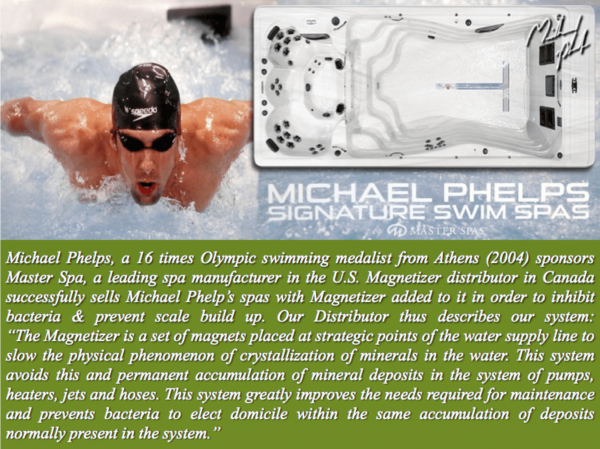 Michael Phelp’s Master Spa in a proprietary configuration—with MAGNETIZER® being an integral part of—is sold in Canada as 100% bacteria free with no need for any chemicals (see link below). We also have tests that confirm the reduction of coliform after the treatment of water with MAGNETIZER®. There are several other instances in which bactericide effects have been noticed in cooling towers and water treatment plants. Cited below is a testimonial from a large pharmaceutical company’s subsidiary in Europe about the usage of MAGNETIZER® technology in medicine production plant to prevent bacteria growth effectively. 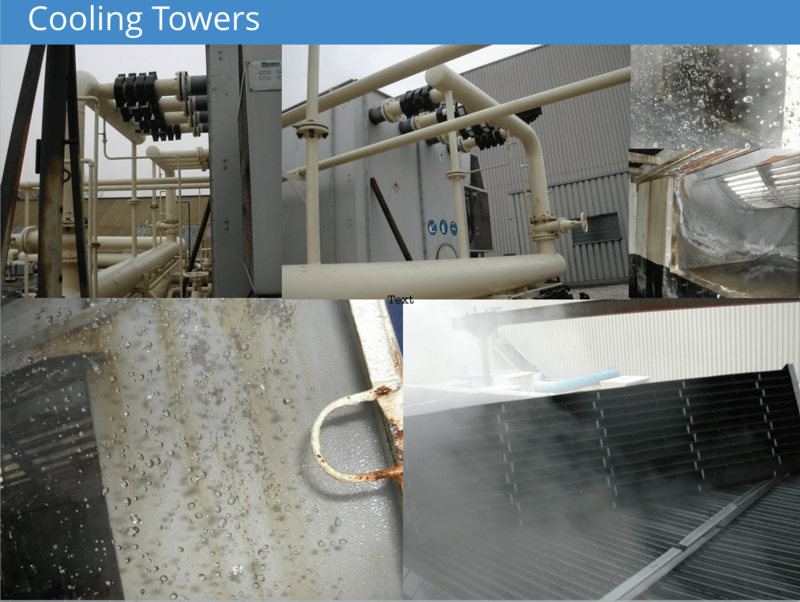 New York Hilton Hotel in Manhattan: A series of Magnetizer® Water Systems have been installed on cooling towers and two 250 ton coolers for several years now (see the video above). The scale has been reduced practically to zero and use of chemicals has been reduced to zero except for a small quantity of biocide, required by law to stop the algae growth. The maintenance cost has been significantly reduced as well (see the testimonial below). Some of the test references are presented below. 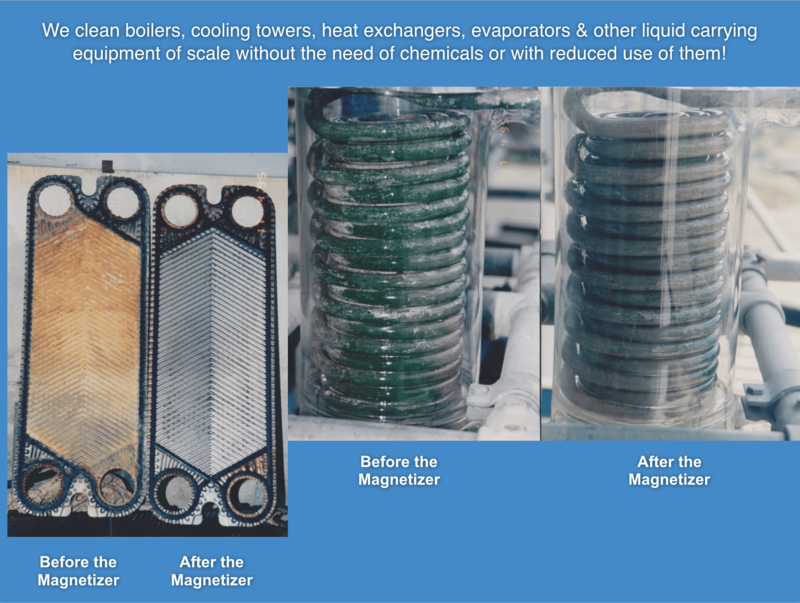 Magnetizer® on Cooling Towers – one of the best examples of its non-chemical water treatment application. 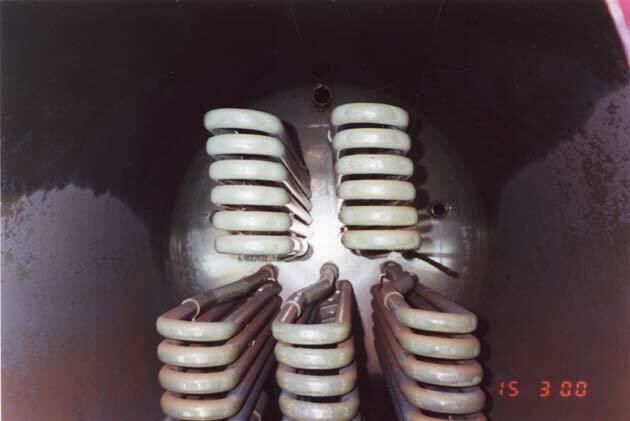 Heat Exchangers, Evaporators, Condensers, etc. MAGNETIZER® use can be also found on injection molding machines and other applications where water and heat is a factor. 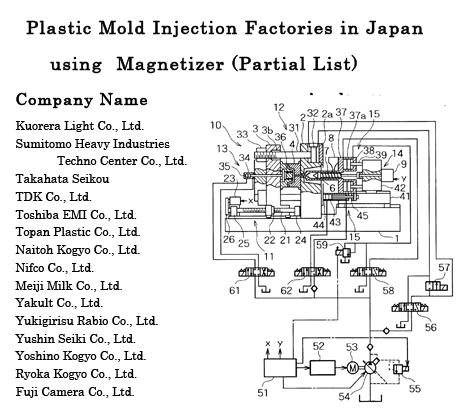 Here’s a partial list of factories in Japan—using injection mold machines—who are fully satisfied with the MAGNETIZER® technological solution: These Japanese referrals are very important, since they are a very good example of the MAGNETIZER’s usefulness as it has become the established national industrial standard in Japan, one of the world’s most demanding and rigorous engineering environments. You may also want to see the Japanese Magnetizer® Client List with all major Japanese companies using the MAGNETIZER® technology. Shortened stiffening time and significantly increased durability, 65% increase in cement bending resistance, 58-112% increased pressing resistance (excerpted from a scientific study). MAGNETIZER’s unique water restructuring capability can be harnessed for the benefit of the concrete industry: 1) Prepping water at the time of concrete laying in order to achieve the desired results, such as: a) Shortened stiffening time. b) Significantly increased durability. c) 65% increase in cement bending resistance. d) 58-112% increased pressing resistance. e) Better plasticizing properties, which allow lowering the water-to-binder ratio in a building mix with water passing through MAGNETIZER®. 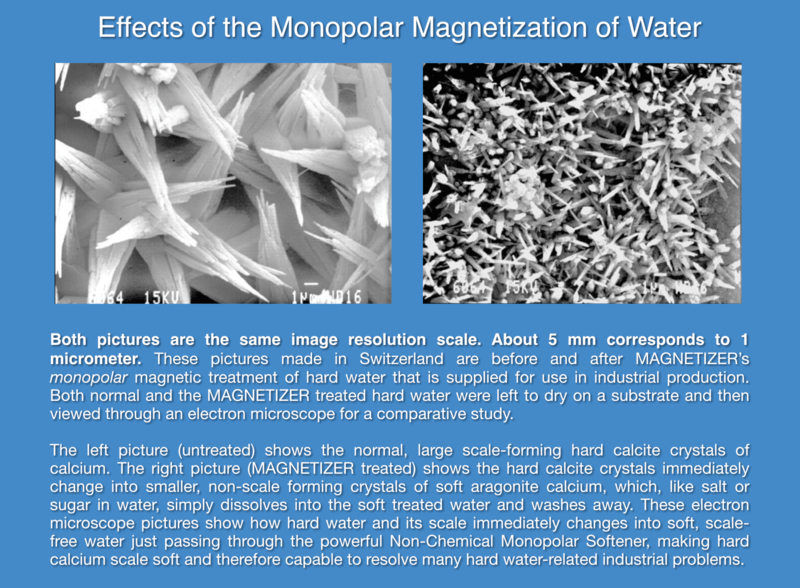 f) Condensing of components and reducing the amount of air inside of the material (microscope observation) caused by the use of magnetized water. g) Increasing concrete/cement durability by 5-100% compared to parameters of materials of same substrates with raw water base for materials of gypsum slurry, cement, and ash mortar. e) Materials made with pozzolanic ashes will have durability 300% greater when using MAGNETIZER® treated water. 2) Cement producing plants with MAGNETIZER® Fuel Savers can reduce GHGs, such as CO, CO2 as well as NOx. More information here. 3) Cement mixing diesel trucks with MAGNETIZER® Engine Performance Maximizer Systems that are cheaper than scrubbers (but work well with them) and allow fuel savings due to the reduction of emissions. MAGNETIZER® can bring to cement companies operational savings on their fleet exploitation costs by reducing diesel fuel consumption by 5-15%, as well as enhance their trucks’ environmental footprint. MAGNETIZER® increases the efficiency of the wastewater station by precipitating sedimentation in sludge tank mixers, inhibits bacteria & algae growth and more. As far as the sewage plant operation itself is concerned, MAGNETIZER® enhances its effectiveness, making it more efficient and environmentally friendly, as it precipitates sedimentation in sludge tank mixers, increasing their hydration in the range of 76 to 84% (depending on the proportion of the preliminary sediment to the excessive one), decreases usage of flocculant (by 35%, i.e. from 3.4 to 2.2 kg / t of dry matter), eliminates and prevents struvite depositing in pipes and more. We can also guarantee you a significant improvement of the parameters of the hydrated sediment in the station of polyelectrolyte mixing. MAGNETIZER® will make affluent waters cleaner and environmentally safe. Magnetizer technology has been successfully deployed in one of Europe’s largest water treatment plants, i.e. on the Psyttalia Island, near Athens, Greece. 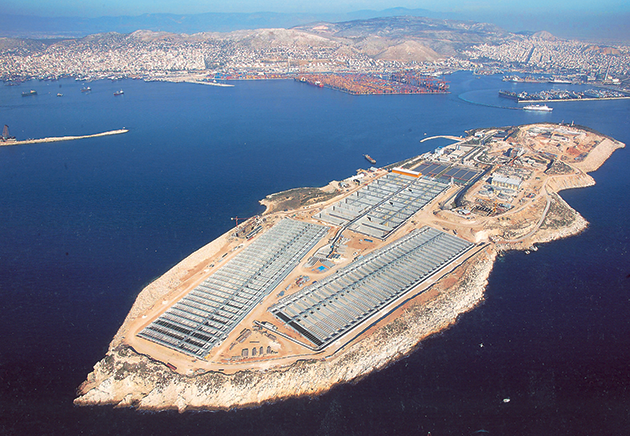 Here’s a report from another modern wastewater plant built through the EU funding. Clothes are reported to come out with better quality and fewer detergents, as well as less fuel (NG) used for the cleaning operation. Better fire suppression, more water delivered, a drop in surface tension permits the fluid to enter into a gaseous or non-liquid (steam) state more rapidly. Based on real-life usage conditions and tests, including those carried out by the Universal City Fire Department, in fire suppression systems MAGNETIZER® delivers more water through the sprinkler system due to the reduction in surface tension of the fluid. However, there is an additional benefit beyond the increased rate of water. A drop in surface tension permits water to enter into a gaseous or non-liquid (steam) state more rapidly. Whenever a liquid goes from liquid to gaseous state, there is an absorption of energy (cooling). Since water is used to extinguish a fire by cooling it rather than suffocating it, the MAGNETIZER® system quells fire more readily than the mere percentage increase in delivery rate would indicate. 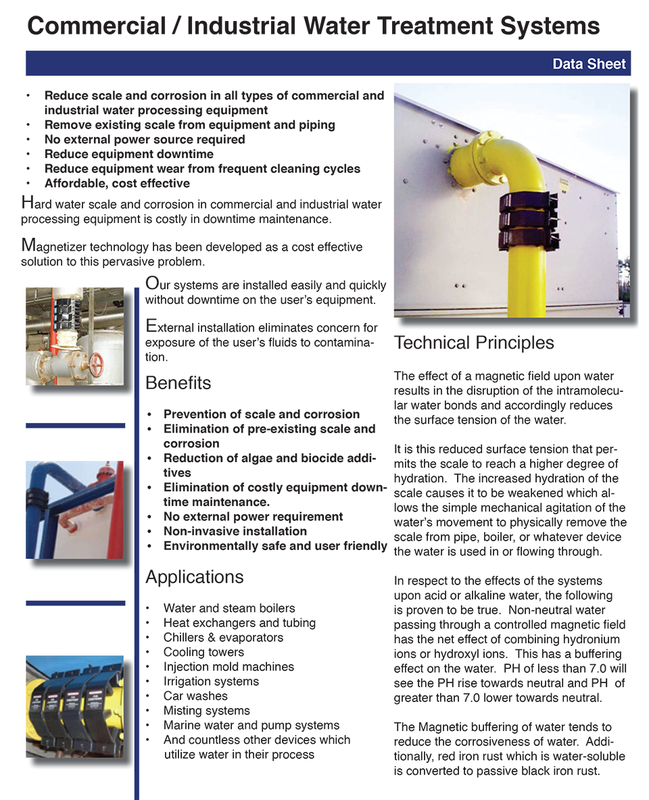 MAGNETIZER® not only makes the water being used to fight a fire more soluble (wetter) but also provides savings in repair and replacement costs due to protection against scale, corrosion or metal pitting. The more soluble the water, the better the results in firefighting. By applying full protection to both incoming and outgoing water, it is possible to drastically affect the operation of firefighting equipment, making it more efficient while providing savings to the property owner and overall enhancement of the safety factor. There are no further replacements necessary as MAGNETIZER® has a Lifetime Power Warranty. No modification to sprinklers/pipes (it is a snap-on device), no power necessary for its operation and no risk/hazard to people or electronic equipment and valves. C) Retard the acidity that causes rust and deterioration of the internal parts of pumps and pipes. 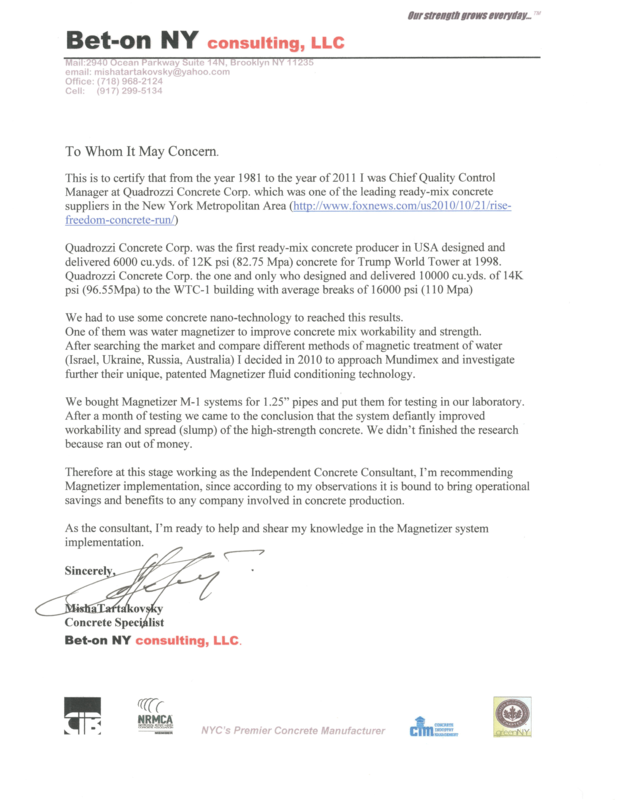 MAGNETIZER® has been thoroughly and positively tested by the FD of Universal City, Texas, with their findings attached. Magnetizer descales a water heater. Remnants of powder converted scale can be easily hosed off. Testimonial from a pharmaceutical firm Biogal, subsidiary of Teva confirming 80-90% bacteria colonies inhibited by Magnetizer. Medicine manufacturing Plant BIOGAL S.A.
Testimonial: about Magnetizer installation in the station of ion softeners on raw water and after anion exchangers. Introduction: We use a considerable amount of water passing through ion exchangers for the production of medicine. In water directed for usage, apart from chemical parameters, a number of bacteria contained in it is very important. Quality requirements demand to maintain the [bacteria] colony amount below 1000. Through the trial, we have come to a conclusion that the mentioned amount can be maintained only if we rinse the pipes after ion exchangers two times weekly with a sub-chloride solution, as well as if we limit the work of ion exchangers to 72 hours (successive regeneration of ion columns also annihilates bacteria). During rinsing the work of those columns is stopped for 1.5-2 hours, whereas such a downtime creates production problems. Changes occurring after Magnetizer installation: on 11.22.2001 several rings of Magnetizer, pieces were installed in two places in the sector of production of water softened by ion exchangers according to directions of the company Mundimex Magyarorszag Kft. Upon trials, we were looking for the best place to work for Magnetizers. Due to the complicated character of the system after the third trial, we succeeded to find it. The advantage of this device is without a doubt that it can be installed without the necessity to modify the installation, only through snapping to the outside of the pipe. Before the installation and subsequently after it, we carefully measured daily the amount of growth of the bacteria colony. The results confirmed expectations – there was the reduction by 80-90% of bacteria colonies. We also lowered by half and subsequently totally eliminated the amount of sub-chloride used to disinfect installations. Despite this, we still have been able to maintain the biological cleanliness of the water. After tallying results at the end of February 2002 we purchased these devices and since that time we are continuously using them.